International comparable measurement instruments for educational attainment are among the basic tools for sociologists’ work. 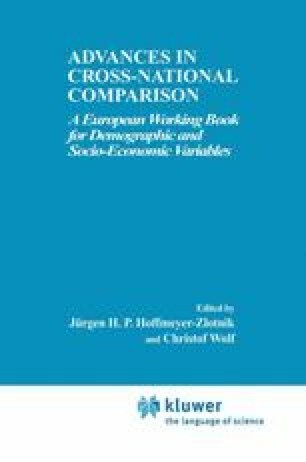 We propose a revised version of the CASMIN (Comparative Analysis of Social Mobility in Industrial Nations) classification of education, which in the meantime is among the most widely used tools to measure education — besides level or years of schooling or the ISCED classification (see Chapter 10 in this volume). The CASMIN scale has been developed within the social stratification framework in the 1970s in order to capture the effects of different educational systems on processes and patterns of inter- as well as intragenerational mobility. However, the original CASMIN coding schema does not capture the changes that took place in national education systems in the period of educational reforms and expansion.2 For contemporary comparative research, the many forms and levels of vocational qualification as well as the institutional diversification within general education need to be taken into account. We, therefore, present an ‘up-dated’ and partly revised version of the CASMIN classification, including some substantial reformulations and modifications of the original version. Financial support from the Deutsche Forschungsgemeinschaft (DFG) (Projekt ‘Bildungsexpansion und soziale Reproduktion in Europa’) and the Mannheimer Zentrum für Europäische Sozialforschung (MZES) is gratefully acknowledged. We thank Walter Müller from Mannheim University, Annick Kieffer and Catherine Marry from LASMAS-IDL (Laboratoire d'Analyse Secondaire et des Méthodes Appliquées À la Sociologie — Institut du Longitudinal — CNRS), Paolo Barbieri from the University Milan-Bicocca and Cristina Iannelli from CES (Centre for Educational Studies, Edinburgh) for valuable help and suggestions. EURYDICE/CEDEFOP. 1995. Structures of the Education and Initial Training in the European Union, <http://europa.eu.int/en/comm/dg22/struct/struct.html>.